Since I focus a lot on the mis-governance of India by the Nehru-Gandhi dynasty and its hangers-on, the matters discussed here are generally depressing. 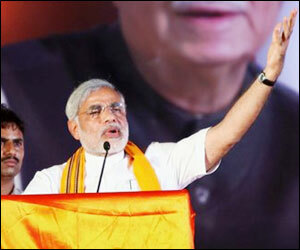 It’s time to contrast that with the successes of Gujarat under Narendrabhai Modi. Here’s a story in India Today on water in Gujarat. The prospects of ground water are particularly grim in India. Gujarat is, however, another story. There the trend is hopeful. Narendrabhai knows what’s important. When Chief Minister Narendra Modi took over in 2001, he laid emphasis on creating farm ponds in areas like north and central Gujarat where building check dams was not very feasible. As a result 1,81,00,000 farm ponds have been built till date at a cost of Rs 181 crore. Farm ponds are built in that part of a farm where rain water collection happens in natural course. In 2003, the Gujarat Government launched the Gujarat Green Revolution Company to propagate sprinkler and drip irrigation technology among farmers by giving them hefty incentives. Rated as the best in the country by the Union Agriculture Ministry for last three years, this initiative is one of the reasons why the groundwater level is getting recharged in the state. Then there are other big irrigation schemes which have helped in enhancing the water table in Gujarat. For example, in north and central Gujarat, the mud canal of the Sujalam Sufalam Yojana played a key role in bringing up the water level. . . Besides these long-term projects, certain short-term initiatives have also worked wonders. Last year, Gujarat had a bad monsoon but when the Government realised that rains could hit the state in the last leg of monsoon, it launched a quick water conservation drive by building boribunds (very small dams made by blocking small rivulets with the help of sand bags). In 20 days, over 2,50,000 boribunds came up as a result of a joint effort by the departments of rural development and forest management, NGOs and village committees. In 2009, Gujarat registered 9.06 per cent agricultural growth rate while the nation’s growth rate was less than three per cent. The total cultivable area in Gujarat has increased by a phenomenal 15 per cent in the past 10 years. During that period, Gujarat’s agro production has jumped from Rs 18,000 crore to Rs 49,000 crore. The state increased its cotton yield six-fold from 175 kg per hectare to 798 kg, more than the world average of 787 kg. “Gujarat has set the finest example of groundwater management through indigenous and modern methods and through people’s participation,” says Tushaar Shah, senior fellow at the International Water Management Institute. When Jhamka and Khopala did it, the rest of Gujarat wondered why not they. It’s time the rest of the country asked the same question. I am hoping that India gets the kind of leadership that Gujarat has had. Another piece of good news before I conclude this. I am off to the US in a couple of days. I will be in the San Francisco Bay area Monday onwards. For starters, I will be on a road trip. Blogging will be light, as it has unfortunately been in the last couple of months. But there’s a rather large archive and if you find nothing new to here, please do visit some old stuff. Indeed with persons like Narendra Modi around, there is still hope for us. The nation has to be ruled by a Kshatriya. He must be fearless to implement the law and hand over punishments. He must genuinely concerned about the welfare of people. He must place country’s interest above self-interest. There are few in India today who have all +ve qualities. Atanu ji, While in US, do you have any plan to visit NY? If so, pl let me know as I would like to meet with you, if your time permitting. NaMo is the only good leader we have. No, the dimpled, cute looking emperor wont do, no matter how much he throws the sagarika ghosh’s and burqa dutt’s into peals of laughter. But we wont get NaMo, we will get the emperor. Here are some interesting stories on how Gujarat managed to achieve more than 9% annual growth in the agricultural sector over the past 8-9 years. Here is one from Daily News and Analysis…. Here is a story from the economist on how the French fries that you order at the local McDonalds is most probably made from Mehsana potatoes…. This economic times article by Swaminathan Aiyer is dated 22 July 2009. Here is an excerpt – “However, an excellent new study suggests that the secret of Modi’s success lay in agriculture, an area completely neglected by political analysts. Ashok Gulati, Tushaar Shah and Ganga Sreedhar have written an IFPRI paper, ‘Agricultural Performance in Gujarat Since 2000’, which highlights something few people know — that Gujarat’s agricultural performance is by far the best in India. Between 2000-01 and 2007-08 agricultural value added grew at a phenomenal 9.6% per year (despite a major drought in 2002). This is more than double India’s agricultural growth rate, and much faster than Punjab’s farm growth in the green revolution heyday. Indeed, 9.6% agricultural growth is among the fastest rates recorded anywhere in the world. That drives home the magnitude of Gujarat’s performance. The authors are attached to the International Food Policy Research Institute. Thanks for the link to that paper, plodder. Poddar, i shall read the weblinks later.Do they highlight how the water problem became a remote history in gujarat now,thanks to Sri Modiji? the media are are antihindu and have been bought off by foreign agencies, and so the hindu leaders, swamis, filmstars and sports personalities will be maligned at the first opportunity. Dont trust indian main stream media. I heard zeenews is still Indian owned and doesnt hate hindus up until now. i do read it regularly. NDTV, CNN IBN, TOI, Deccan Chronicle etc are all bought off long time ago by outsiders…. I have lived and worked in 7 different states in India incl. Gujarat where I began my career and made a bit of fortune. I must admit candidly that Gujarat and Gujarati make one of the finest people in India not only economically but also socially. They make good neighbours, they make good leaders and invite everyone with open arms. If at all any state in India is worthy of praise that is Gujarat. I earned my first 100,000 rupees in Gujarat and I really really love this man Narendra Modi… the only man with a SPINE. Isn’t 100 rupees a bit less for a farm pond? NaMO is one of the best leaders in the country. Unfortunately, BJP, the party behind NaMO, needs many more NaMos which it does not have curently. Also, BJP needs to have widespread presence like Congress across all states or have strong winning alliances with regional parties, much the same way as it did in the election of late 90s when BJP (NDA) won more seats than Congress. BJP just cannot be just the party of wealthy, middle class, professionals, urban or Hindus. It needs to have a wider tent, specially in rural areas. It’s strength needs to be developed in more than traditionally BJP leaning states like Gujarat, Madhya Pradesh, Maharashtra, etc.